Cover with lid, and turn vent to sealing position. Hit PRESSURE COOK for 3 minutes. Pot may take 10 minutes to reach pressure. After 3 minutes cook time, do a quick release when pot beeps. When pin drops, carefully remove lid, stir, then stir in cream and Parmesan cheese until blended. Sauce will thicken as it stands. 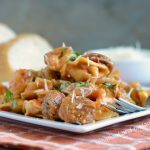 Recipe was made in 6-quart Instant Pot electric pressure cooker using pre-cooked Aidell's Italian Chicken sausage, Buitoni tortellini and Barilla marinara sauce. Taste may vary if using different brands. Recipe can also be made in 8-quart Instant Pot.